In Traditional Chineese Medicine the Five Elements are a very important factor and the concept holds many aspects including spiritual and philosophical. Dr. Wu’s focus is more on the physical aspect and how the Five Elements can help bring balance to your Qi and therefore bring you good health. The body belongs to the Five Elements. In Western medicine much focus is put on the food pyramid, which is constantly changing. The nutritional and health effects of the Five Elements have been consistent for thousands of years. 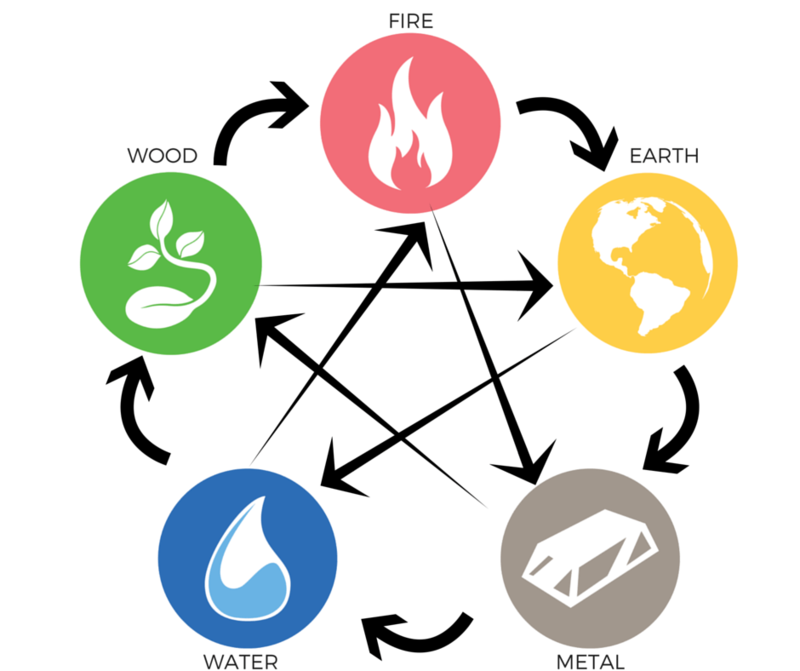 The Five Elements are: Wood, Earth, Fire, Water and Metal. Each element has a color associated with it. Those colors are the key to understanding what each element is beneficial for and the foods associated with each. The Earth element, any brown vegetables or fruits are beneficial to the Stomach, Spleen and Digestion. The Metal element, any white vegetables or fruits are beneficial to the Lungs and Large Intestine. The Water element, any dark blue or black vegetables or fruits are beneficial to the Kidney and Gall Bladder. The Fire element, any red vegetables or fruits are beneficial to the Heart, Blood Vessels, Blood Pressure and Small Intestine. When the Fire element is burning too strong, the blood vessels constrict causing high blood pressure. The Fire is out of control because the kidneys, controlled by the Water element are weak and not producing enough water. By strengthening the kidneys, which will then produce more water, the heat in the fire element is reduced, the blood vessels relax and the blood pressure goes down.